Tadeusz Mazowiecki (18 April 1927 – 28 October 2013) was a Polish author, journalist, philanthropist and Christian-democratic politician. Mazowiecki was the first Prime Minister of Poland. His term began in 1989 and ended in 1991. 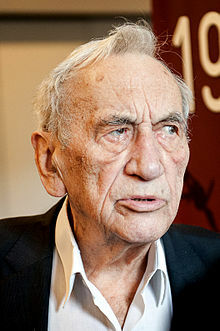 Mazowiecki was born on 18 April 1927 in Płock, Second Republic of Poland. He was married two times (became a widower twice). He had three children, Wojciech, Adam, and Michal. He was formerly one of the leaders of the Solidarity movement. Mazowiecki was the first non-communist prime minister in the Eastern Bloc after World War II. He became Prime Minister on 24 August 1989. His term lasted for nearly 2 years when he left office on 12 January 1991. In 2003, he was elected to the board of directors of the International Criminal Court's Trust Fund for Victims. Mazowiecki received numerous awards. An honorary degree from the universities in: Leuven, Genoa, Giessen, Poitiers, Exeter, Warsaw University and University of Economics in Katowice. He also received the Order of White Eagle (1995), Golden Order of Bosnia (1996), Légion d'honneur (1997), Srebrnica Award (2005), the Giant award (1995) awarded by Gazeta Wyborcza (Election Gazette) in Poznań and Jan Nowak-Jezioranski Award (2004). Mazowiecki died on 28 October 2013 in Warsaw, Poland from complications from a fever caused by pneumonia. He was 86 years old. ↑ "Tadeusz Mazowiecki, Ex-Premier of Poland, Dies at 86". New York Times.com. 2013-10-28. Retrieved 2013-11-12. ↑ Amnesty International, 12 September 2003, Amnesty International welcomes the election of a Board of Directors. Retrieved 1 August 2007. ↑ "Tadeusz Mazowiecki nie żyje. Miał 86 lat. "Uczył nas pokory w polityce"" (in Polish). Gazeta Wyborcza. 28 October 2013. Retrieved 28 October 2013.